UPDATED on 4/17 at 9:31PM EST – The Notre Dame fire is now somewhat controlled. However, the fire is a tragedy and the spires along with the roof was destroyed. On the other hand, it appears that large parts of the interior were not destroyed and all the important relics were saved. Finally, there are no deaths at this point although one firefighter is in serious conditions after battling the blazes in Paris. In terms of the cause, there is no word yet on what sparked the disasterous Notre Dame fire. However, it appears that there was concern about the structure for a while and that it was accidental. However, the authorities announced that arson and terrorism can be definititvaely ruled out. That announcement is strange because although likely accidental how can they rule out a cause before its over? Therfore, the actions by the French Government could spawn a theory that the Macron government is covering something up. Stay tuned for more and see our prior coverage on the fire below. 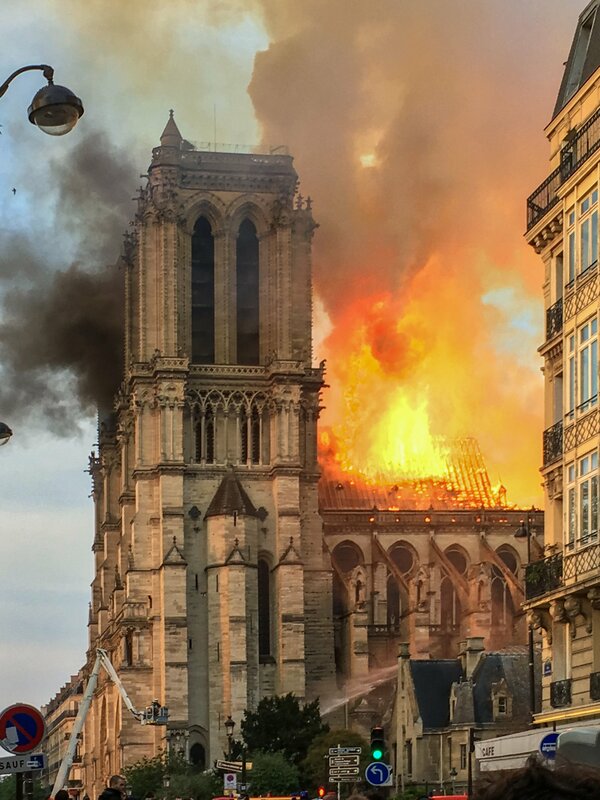 It’s unclear now whether there have been any injuries in the Notre-Dame fire. Neither police, nor firefighters have said whether anyone was inside the cathedral when the blaze broke out. The cathedral is widely respected as a magnificent, centuries-old architectural feat, so many Twitter users are expressing sad sentiments over the loss of the structure’s spire. Firefighters continue to battle the blaze. We’ve just learned that the spire of Notre-Dame Cathedral in Paris has collapsed. This video captured the moment it happened. You can see the spire collapse behind the wall of flame. Multiple media outlets are reporting that flames are shooting out from the sides of Notre-Dame’s famed bell towers. So far the cause of the Notre-Dame fire is unknown, but some reports suggest it could be related to the renovations that have been going on for some time. According to a French TV station, police are treating the fire as an accident. Firefighters quickly cleared the area around the cathedral Monday afternoon, pushing the crowds away from what is one of Paris’ most recognized and popular landmarks. Notre Dame is approximately 850 years old. The French Gothic-style cathedral was made especially famous by Victor Hugo’s novel The Hunchback of Notre-Dame. Paris’ well-known Notre-Dame Cathedral caught fire just a short time ago. Dramatic images of the Notre-Dame fire show a massive plume of white smoke billowing from the top of the historic landmark. News footage from the Notre-Dame fire also appears to show bright reddish-orange flames shooting from the top of the cathedral. Numerous images of the blaze are being posted on Twitter.